Five Manu players will make their debuts this weekend at the Estadio Anoeta, San Sebastian Spain, when Manu Samoa goes head to head with USA for the first time since the RWC 2015. Debutant Kane Leaupepe of Bay of Plenty will make his first appearance for Samoa this weekend when he pairs up with veteran Filo Paulo of London Irish in the locks. Other debutants including Ray Niuia, Ben Nee-Nee, Iakopo Mapu and Stacey Ili will all come off the bench for their first appearance in the blue jersey. Asked what it feels like to be selected into the Manu Samoa squad, Mapu had this to say. The stellar open side flanker from the Aana Chiefs franchise started playing when he was just 16 years old. 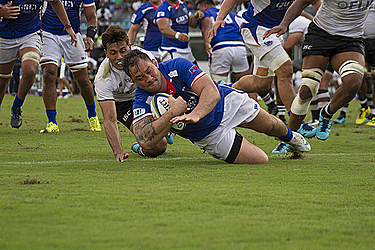 He started playing when he was in college before moving to the Rugby Academy of Samoa where he still trains under the tutelage of former Manu Samoa captain Mahonri Schwalger. Manu Samoa is scheduled to play the USA this coming Saturday 10th November in Spain for the first time after 3 years of their last encounter in New Zealand during the Rugby World Cup back in 2015.